Demonstrators walk away from pepper gas released by police during a protest prior to the start of the G20 Pittsburgh Summit. 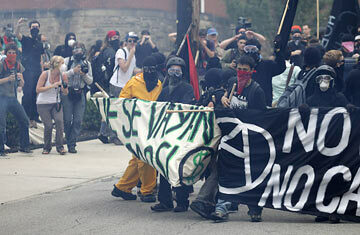 The anarchist march had started at 2:30 p.m. in a park in the working class Pittsburgh neighborhood of Lawrenceville. The sounds of chanting  "Our city, our streets"  mixed oddly with the jingle of an ice-cream truck trying to make some money off the protest crowd, which was led by a banner reading "No Hope in Capitalism." Bicycle scouts reported police locations to the marchers, who had swarmed around an unmarked police car just a few blocks after their start. Still, the first confrontation between anarchists and cops was over quickly. The police took less than half an hour to block the anarchists' way downtown, stopping them on the wide expanse of Liberty Avenue and forcing them to reroute. "I hereby declare this to be an unlawful assembly," came the booming pre-taped police announcement  the first of at least six aimed at the march of about 800 people against the Group of 20 economic summit of the world's richest countries that had started in Pittsburgh's convention center Thursday afternoon. The announcements also made clear the consequences of not dispersing: "The use of riot control agents and less lethal munitions." The organizers of the protest had refused to seek an official city permit. But the march had the citizens' attention. On every main thoroughfare, onlookers filmed the spectacle, some offered water to marchers, others cheered on the cops. As the first order to disperse went out, marchers slowed and chanted their defiance, but also retreated to regroup and then ran into another line of riot-ready cops and police vehicles as they neared an alternate route  the first of several direct avenues to the summit site they tried. This time, the dispersal order was followed by smoke, then two canisters of OC  Oleoresin of capsicum, that is, pepper spray. Both were kicked back at police. A small protester contingent rolled a Dumpster down the steep hill, which hit something with a boom, although it was hard to see through the denser, choking pepper spray. As the group fled through an alley and individuals knelt for medics to flush their eyes, one of the men shouldered the lead banner, shouting, "Let's make them use all that s--t!" As the protesters redirected what turned out to be a winding, three-hour trek, they pushed more Dumpsters into the street, or downhill toward law enforcement, and smashed the windows of a Boston Market and Mini car dealership, along with 17 banks and other businesses, by police count. The cops countered with repeated use of a projected, high-pitched noise that had many marchers plugging their ears  reportedly the first use of such a device in the U.S. In one of the few times police gave chase rather than standing their ground, they were pelted with rocks and pieces of macadam, countering by firing projectiles. In that instance, they arrested one man, pressing him into a crouch with a baton behind the neck. Police amassed in increasing numbers the closer the march got to the convention center's western end, on 10th Street downtown. It never got closer than 32nd Street, at the end of the march's first hour. In total, police reported 19 arrests in seven different locations; 42 more were arrested at a gathering later Thursday evening. More actions by the Resistance Project, which spearheaded the march, were advertised for Friday. The organizers declared a victory  if only because they kept watchful residents and television captive for hours.